It is Saturday morning april 13, 2013 and our Ozarks native bees research is getting underway. This is our first experiment and may be the first of its kind in this part of the Missouri Ozarks. This research is taking place in Dora, Missouri on Richard Eckart's blueberry farm. The blueberries were planted almost 15 years ago, so there should be numerous bee species. We are especially looking for mason bees (Osmia lignaria), the blueberry bee (Osmia ribifloris), hornedfaced bees (Osmia cornifrons), and the summer leafcutter bees of the Megachilid species. 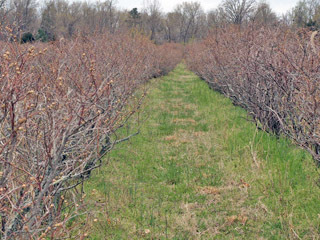 In addition to blueberries, Richard has cherry trees and thornless blackberry bushes. This should be the dinner bell for a lot of native bee species. We are hopeful and expect great results. Time will tell. The temps are in the 60's. 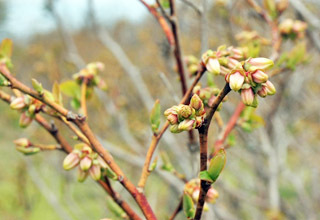 The blossoms on Richard Eckard's 10,000 blueberry bushes are just days away from opening. Pretty soon these trees will be buzzing with activity. Richard brings in 5 honey bee hives, but there is a lot of evidence that local native bees are also in the air. Richard told me that each year he sees many small holes filled with dirt, but never knew what was responsible. We are not releasing any bees from cocoons this year. This ensures that all bees that inhabit the nesting tubes will be native to this area. Introducing bees would not be good for this project and would alter the results. I selected the spots for the bee houses, as seen in the photos above. Mason bees do not like to fly more than a few hundred feet from their nesting tubes, so the boxes are very close to the blueberries. Both houses are facing east. 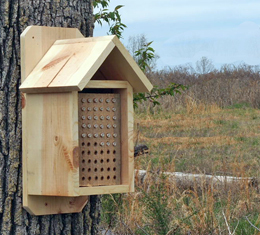 Bee houses should face east or south and not facing north or west. Facing east allows the bees to catch the morning sun to warm them and they are better protected from northern or westerly winds. The first house, in the photo to the left and upper left, was placed on a tornado-killed oak tree. 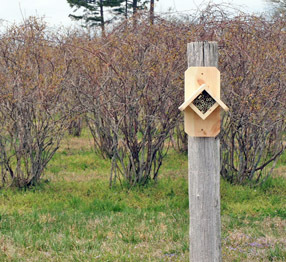 The second mason bee house, seen in the upper right photo, was placed on a post on the outer edge of a blueberry row. I will be placing other houses on the east side of the barn in the next few days. The house on the tree trunk consists of a drilled wood block inside a custom-built shelter to keep the rain out. The block has 60 drilled holes. Half the holes have cardboard liner inserts and the other half have cardboard liners plus paper stray inserts. The triangle space above the block can be used to hold bamboo nesting tubes or a bee release box. These houses, or similar structures, are essential to help protect the nesting bees from water and wind. A metal screen can be placed over the front to protect the tubes from woodpeckers. Our bamboo tube bee houses have two different types of bamboo tubes, lighter colored and dark brown bamboo. 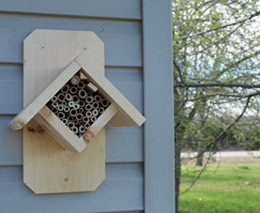 The purpose is to see if the local native bees prefer one type of nesting tubes over another. The photo shows the same model of bamboo bee house at an apple orchard. The bamboo tubes should be fairly tight in the box to keep them from moving around. I have inserted two wood scraps to take up space and lock the tubes tightly together. If you do not have enough tubes to fill the space, use string to wrap the tubes tightly together or use any method that works. As mentioned above, this is our first experiment with native bee research in the Ozarks. We set out only bee houses loaded with tubes. We purposely did not put out mud for the bees. Why? We wanted to examine how well the bees were finding and utilizing mud and pollen without our help. After all, they have been doing this on their own for hundreds of years. In nature, bees have good years and bad years depending on the conditions. We were quite disappointed to see very little activity in the tubes. Most of the tubes are completely empty. The cardboard tubes set inside the wood blocks seem to have the most activity. Most tubes were not completely filled. It seems that the blossoms may have fallen before the bees could fill the tubes. However, many tubes are partially filled, which is good. It means that there are native bees working in the area. The tubes I use have a small hole at the back end. With our tubes, you can hold up the tube to the light and if you see sunlight, the tube is empty. If you don't see light the tube is partially filled. You can feel a difference in weight between and empty tube and partially filled tube. The photo shows a tube that is partially filled. These tubes are filled with the next generation of mason bees. We want to see as many filled tubes as possible. For whatever reason the mason bee did not finish filling this tube. In nature, many factors have to be in place for a bumper crop of mason bees. There needs to be a pollen source available when the bees emerge. There needs to be a damp and workable clay mud source for the bees to seal the cells and opening. There needs to be the right sized tubes or holes available to the bees near the mud and pollen source. If just one of the above items are missing or not in a usable condition (i.e. mud source too dry) the bees will fly away in an effort to find all three of these things together. If unable to find these things, the bees will die without leaving the the preparation for the generation of mason bees. 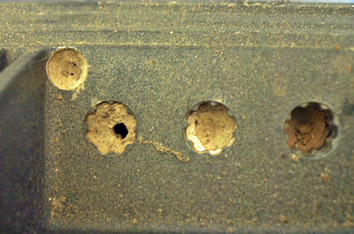 Native bees are not helpless victims in their effort to find suitable holes. In the photo to the right, last year native bees made use of several half-inch tool storage holes in an air compressor. These holes are to store individual hose tips, but I never stored them there. The bees found them, but there are several problems here. The hole are vertical, certainly not optimum. They are also too short and only one or two bees at the most could have emerged from each hole. Short holes usually contain only male bees. They are also too wide. The largest holes they seek out is 3/8 inch, but I suspect these were used because there were no other holes available at the time. Only one of the four holes had any bees survive and emerge. The compressor was in my shop and these bees may have been the male bees I saw in the shop window. They emerged early and their were no tree blossoms, but there were plenty of dandelions, another food source for mason bees. It can't be overstated that all three factors need to be in place for native bees to succeed. 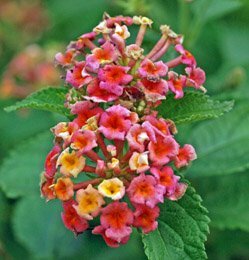 Available blossoms that are attractive to mason bees. We will provide A moist clay/mud source available throughout the time bees are actively flying. Suitable holes or tubes for bees to use. These tubes need to be the type for easy access to cocoons. I was recently talking to another bee researcher on the west coast that is experimenting with mason bees in orchards. He lost 10,000 out of 15,000 bees due to problems associated with the mud. Most homeowners can easily avoid this problem. In a backyard setting, keeping mud available and moist is easy. In an orchard with many thousands of trees, it becomes a greater challenge. Make sure you have tubes in an appropriate house so they stay dry, clay type mud that is kept moist, but not soaked, and have a pollen source. The pollen source could be trees, flowers, flowering shrubs, native weeds like dandelions, etc. Our first year results are in. If you followed this page, we began our native bee research at a local blueberry orchard but had poor results. 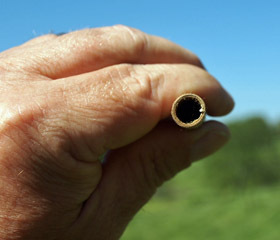 The summer native bee tubes had greater success. At the beginning of summer we placed several bee houses at an apple orchard. Learning from out mistake, we purchased leaf cutter bee cocoons from our distributor in Washington and placed them near the tubes. It took approximately four weeks before we begin seeing leaf cutter bees entering the cocoons. We saw no summer mason bees. The photo above shows the first 3 tubes filled. 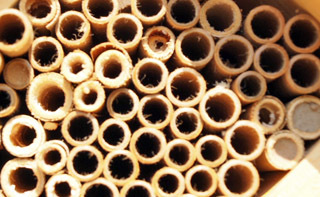 The bee house is a mixture of cardboard tubes and natural reeds. Many more tubes would be filled before summer's end. First, let me say that the bamboo tubes were a total failure. We cut bamboo to six inch lengths and split the bamboo tubes in half to easily harvest the native bee cocoons. We then put the halves together and wrapped them tightly with rubber bands. Not one bee used the bamboo. Good thing, too. The rubber bands deteriorated before the season was over. We also used cardboard tubes and cardboard tubes with white paper inserts. These tubes can be seen in the photos above. The white paper inserts can be easily removed from the cardboard tubes and a new paper insert can be inserted. However, only two bees used the cardboard tubes with paper inserts. In addition, we noticed the white inserts could not stick out farther than the edged of the block. We also placed hollow reeds similar to cattaills. These reeds were are dried and easily split with a wood look and feel. However, less than one quarter of the bees used the tubes. Most bees used the cardboard tubes. Maybe because they are wood colored and have a wood texture more so than the white paper inserts. Leaf cutter bees were actively working in the tubes. As you know, leaf cutters are not plant specific, but will pollinate many different plants. We had a wide range of flowers, vegetables, trees, and shrubs they can pollinate. In addition, we have a pasture with wild native plants plants, including wild berries. We saw both mud filled tubes and tubes filled with pieces of leaves. We noticed the mud plugged holes were in tubes smaller in diameter than the leaf cutter bee tubes. We assumed the mud capped tubes were from the smaller summer mason bees. Although we never saw beneficial wasps (looks similar to dirt dauber wasps), they were apparently very active in the holes as well. We logged the number of filled tubes we observed. However, we noticed after the filled tubes sat for a couple months, many had a small hole in the outer plug. It was especially noticeable in the dirt plugged holes. I thought it may have been as escape hole from a parasitic insect inside the tube. After consulting with a fellow bee expert, Dave Hunter, I found it may have been a parasite entering the tubes, namely the carpet beetle. Carpet beetles will consume the larva inside the cells and is a major enemy of solitary native bees that are bred inside tubes. After about five or six of the tubes showed damage to the plugs, I removed the remaining plugged tubes and placed them in a pillow case. The pillow case makes a great storage container which was then placed inside my shop. After the tubes spent a month inside the pillow case, I opened the case to check on the tubes. 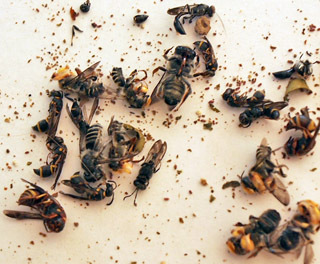 There were numerous wasps (undetermined varieties) and some leaf cutter bees that hatched out and were dead in the pillow case since they couldn't escape. In the Photo, the leafcutter bees on the lower left have white stripes on the abdomen. The larger leaf cutters are about 5/8 inches long. The smaller leaf cutters are no longer than 1/2 inch long. I am not sure if they are two different varieties. One could possibly be a native bee and the other an introduced variety. I don't know for sure. There are at least two types of beneficial wasp varieties in the photo. What I thought was a parasite killing the bee larva was no parasite at all. It is warm enough in Missouri that the bees hatched out. The holes in the tube plug was actually from the bees themselves. It appears that unlike mason bees, leaf cutter bees do have two generations if the weather is warm enough. Sadly, I have seen no evidence of mason bees using the tubes. It could be there are no mason bees in this area. I will try introduce blue masons next year if I can find some locally. If not, I will further expand my leaf cutter bee research since they are also magnificent pollinators. We saw no evidence of parasites attacking the larva. No mites, no carpet beetles, no parasitic wasps. For now, if we can stay out of the bee's way, we can have an incredible harvest of summer bees here in Missouri. Both mason bees and honeybees are incredibly beneficial to life on earth. Both bees pollinate, but their methods are different. Find out why researchers say the mason bees are the better pollinator. Learn about our native Orchard Mason Bee life cycle. You will also see why this bee is so gentle and great for home gardens and backyard orchards. Pollen mites can harm your bees. If you harvest your mason bee cocoons (and you should), learn how to remove mites from bee cocoons to ensure a good spring emergence. Examine the popular types of mason bee houses, including pros and cons, for making the best choice. Mason bee cocoons need to be removed at the end of the season. This will keep emerging bees healthy and helps protect the next generation. Find out how to harvest cocoons here. Spring mason bees emerge in nature when temps rise into the 50's. Harvesting cocoons in the fall becomes necessary to prevent bees from emerging too early before blossoms are on the tree.